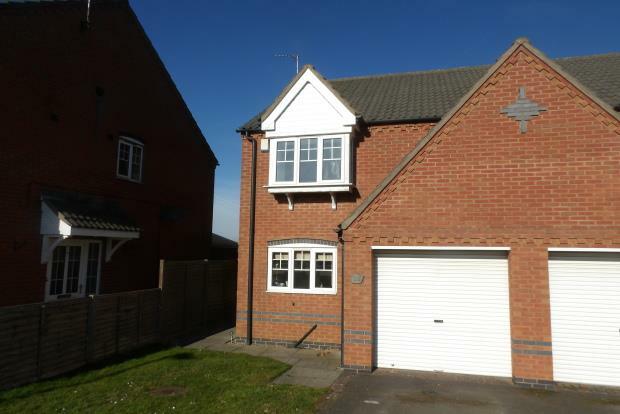 3 Bedroom Detached House To Rent in Coalville for £725 per Calendar Month. This modern three bedroom semi is located in the middle of the countryside in Battram, just outside of Ellistown. On the ground floor the property has a modern fitted kitchen with a range of wall and base units, a fridge-freezer and a washing machine provided. Also leading from the side entrance of the property is the light and bright living room which boasts countryside views at the back. There is also a large space for storage under the stairs. To the first floor is the large master bedroom with en-suite, one further double, and one single. The modern family bathroom is also situated on this floor. Externally there is a driveway with enough parking for two cars and a single garage. There is a garden to the rear which overlooks field views.